There is excitement atop London's Gipsy Hill. A new neighbour is moving in. 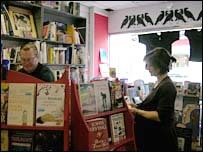 "I can't wait," says mother-to-be Rachel Hogger, while buying a greeting card at the Bookseller Crow bookshop. A party is even being thrown to mark the event, says Jonathan Main, who runs the bookshop. The cheer is not to welcome a new tube line, or the arrival of a celebrity. Instead, locals are greeting a much-maligned modern character: J Sainsbury. "A local campaign, led by the local traders, was started to get Sainsbury's to come," chief executive Justin King tells the BBC News website in an interview. "And we have secured the lease. We're going." The reception given to Mr King and his retailing empire contradicts popular perceptions of supermarkets as wreckers of communities. Here, some of those cheering the loudest are local firms, traditionally seen as victims of supermarket might. As reggae plays in his bookshop, Mr Main is upbeat. Like others, he hopes Sainsbury's arrival will reverse a sharp decline in business. Sales of books have fallen 30% since Christmas. Other stores are suffering too. 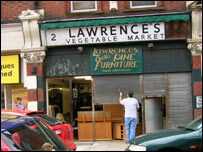 Gloom set in when Morrisons closed the Westow Hill Safeway branch last November, as part of the supermarket's obligation to shut or sell off several stores following its £3bn takeover of its rival in March 2004. When the supermarket goes "the bottom falls out" of the market, says Mr Main. "People doing their weekly shop disappeared and [the number of] passers-by plummeted." Sainsbury's expects some 4,000 customers to visit its store each week, and local shop-keepers expect a trickle-down effect. 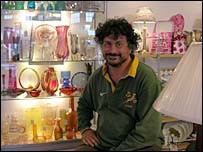 Tim Taylor, who opened homeware store Glitter & Twisted nine months ago, likes the maths. "If only 1% enter my store, that is an extra 40 people," he says. 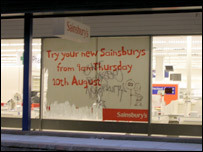 The warm welcome granted Sainsbury's here does prove that supermarkets can be beneficial to local communities. When Safeway arrived here in 1985, Mr Main says, referring to an illustrated book about the area, "There were two grocers, a baker and a fishmonger. Perched on a bar stool that is for sale among the home goods in fellow trader Tim Taylor's shop, Andy Bambino explains why locals begged the supermarkets to come. Though a farmers' market has started and a Budgens has opened, these do not fill the supermarket gap, he says. The nearest "proper" supermarket - Tesco - is far beyond walking distance. After six o'clock in the evening, choice is severely limited. "Little old ladies have been forced to take buses or taxis to shop," Mr Bambino says. "I hate supermarkets, but this [area] can't survive without one." Local residents did not want just any old supermarket. Their attempts to convince Waitrose to come here failed - but they say Sainsbury is a good second choice. Unlike Morrisons, which locals say duplicated existing services such as dry cleaning and pizza delivery, Sainsbury's is keen not to upset the community. It will have a fresh fish counter "which makes far more sense", according to Mr Main. "Our stores should be a part of the communities in which they trade," insists Mr King. 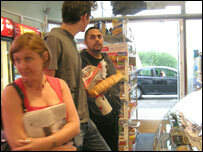 In Sergio's deli, which is very popular with locals, the response to Sainsbury's arrival is less glowing. "Locals will end up doing all their shopping at Sainsbury's," argues full-time mother Diane Barker, leaning over a counter laden with olives, salads and cakes. 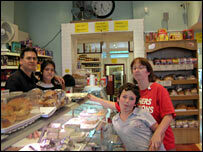 Still, the views of Sergio Gonzales, manager of a family-owned deli, are more nuanced. It should enable his store to focus on being a deli, he says. "We know the customers," he adds, nodding to local cab-driver Marcus. "We hope that will make a difference." Nonetheless, he predicts daily takings to fall by £300 to £400, from a total £1,300. Brow furrowed, Sergio's father Jaime Sepulveda is visibly concerned. "People don't care about quality," he declares. "Long-term there will be five standards of food," one for each of the five big supermarket chains. "It would be far better if we had specialist shops - a butcher, a baker, a fishmonger," he sighs. It would be naive to blame Morrisons' departure alone for the local decline, just as it would be naive to expect Sainsbury's to solve all community issues. There are other problems in the area: the one-way system and the lack of parking to name just two. And what works for one part of London may not be the answer everywhere. "Supermarkets are just endless aisles and trolleys," says contractor David in his Midlands accent as he packs up for the day, having spent hours refitting the new Sainsbury's store to get it ready for Thursday's opening. But Morrison's departure did make food shopping more difficult, especially for the elderly and those without a car, and often more expensive. Close to the local station lies Sainsbury Road - an auspicious sign perhaps? Locals hope that Sainsbury getting its way means they can too. Is Sainsbury's tasting the difference?